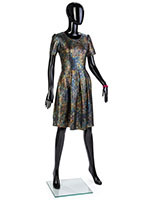 Black mannequins are an appealing way to display clothing items in your retail store. 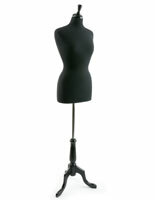 The simple, glossy look of these mannequins are a sleek, attractive way to display clothing. The black gloss finish is a great contrast to a bunch of different outfit styles. The abstract design is also a great way to get away from the traditional realistic style of mannequins, which many stores like to avoid. Having realistic facial features can often detract from the outfit itself and be distracting for many people. Abstract styles are becoming increasingly popular in the retail industry. While many different colors like red work seasonally, black can be effectively used any time of the year. 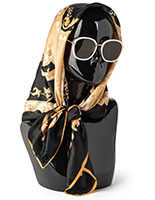 Glossy finished mannequins are much more eye-catching than matte mannequins. For marketers trying to get more people into their store this could be a great way to get started. Every little detail helps, and that extra shine coming from a mannequin could get more customers through the door. Arrange a wide variety of figures to any storefront is always an effective method for catching more peoples attention and prominently displaying featured products.